I have served private and commercial vessel professionally for over 20 years. I hold a USCG 100 Ton Masters License which is endorsed to 100 Tons for sailing vessels as well, having logged in excess of 100,000 nautical miles at Sea. 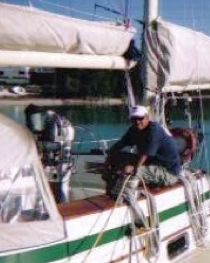 I own and operate two charter vessels of my own in the Florida Keys. I am annually contracted by the Boy Scouts of America to provide a 6 day live aboard high adventure sailing experience for Youth from around the country. I own and operate Big Pond Boatworks and provide custom marine services from stem to stern. As a registered boatbuilder and member of the American Boat & Yacht Council my custom fabrication and finish work has been honored at several Woodenboat and Antique & Classic Boat Society shows, with Best in Class, Best in Show, Peoples Choice awards and several Firsts and Seconds in the crafts particular classes. Two of which can be found in Woodenboat Magazines registry of wooden boats. I feel "an ounce of prevention is worth a pound of repair" and "discretion is the better part of valor". I do not risk others lives and or property. I say what I do, do what I say and like to think I provide my clients with a certain level of pride and professionalism which I bring with my craft.